Mad Men The Strategy recap: Don and Peggy dance. Don and Peggy, Mad Men’s central couple, reach an understanding. Elisabeth Moss as Peggy Olson and Jon Hamm as Don Draper. Don and Peggy are Mad Men’s two fundamental protagonists, and the complex bond between them has always been, for me, the heart of the show. Don appreciates Peggy’s talent in a way that no one else quite does. And, more than anyone else, it’s Peggy who draws out Don’s humanity. When she asked him in this episode if he’d parked his white horse outside, she was referring to potential last-second heroics on the Burger Chef account. But let’s not forget that, in the personal realm, Don has been Peggy’s knight in armor on more than one occasion. Thus, it’s pained me to see my favorite duo on the rocks of late. Their reconciliation tonight was delightful to observe, all professional respect and collegial warmth. It was the second-sweetest scene of the season, surpassed only by the moment when Sally told Don she loves him. Something melts in my heart whenever Don—a man who seems to think himself unworthy of real love—receives affection from the sharpest, coolest women in his life. That slow dance was a catharsis for Don and Peggy as they once again recognized that they’re each at their best when they function as a team. No matter which of the two is nominally in charge, they appear to acknowledge that they are intellectual equals. And they both love the work. Even when it’s a Burger Chef campaign, they’re more interested in creating something true and good than in merely winning the account. But I find I need to ask: That intimacy was purely platonic, right? Please, Matthew Weiner, do not stoop to mash Don and Peggy together romantically. 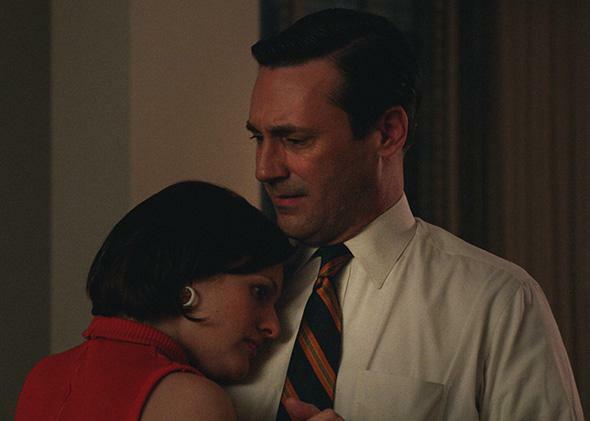 It will make Mad Men feel like one of those unimaginative, long-running shows where by the end all the characters have taken turns hopping in and out of each other’s beds. We previously saw Roger’s daughter asserting her right to be selfish, and last night the show’s portrayal of the steady ascendance of the Me Generation continued apace. “You think that’s a coincidence?” Don asks when Peggy notes that radio stations keep playing Sinatra’s “My Way.” The needs and wants of the individual increasingly reign. The self-abnegating family values of the 1950s are gone, and whole new kinds of families are taking root. After hearing that GM executive describe his wife’s tolerance of his homosexuality, Bob Benson asks for Joan’s hand in a sham marriage. She refuses to be his beard, though, as part of “some arrangement”; instead, Roger and Joan seem fated to team up as they endeavor to halt the soulless juggernaut that is Harry Crane. Could these be the first stirrings of renewed ardor? Will Kevin have a daddy after all? Again, a less-than-traditional origin story for a domestic unit, but I bet they could make it work. When Pete planted his bottle of Rheingold in that frosted cake, it seemed as though he wished to plant his flag on his old turf. It’s hard for me to understand why he’d want to ditch Bonnie and his new life in L.A., when he seemed to be thriving. A return to Cos Cob feels like a regression—does he even want to be a family man? But Pete is a man who will never let himself be happy, and he insists on having his (beer-smushed) cake while eating it, too. That pull-back shot as the episode closed framed Pete, Peggy, and Don as a happily dysfunctional work family breaking bread at a shared table. But there were also hints of the real-life family that could have been. Don had earlier noted that Peggy’s original idea for the Burger Chef campaign “absolves the mom,” and I was reminded that in this burger-munching tableau Peggy is flanked both by the man who made her a mom and the man who helped absolve her of that responsibility. We’re rounding the home stretch of this seven-episode run. What are you two hoping for from next week’s finale, which is ominously titled “Waterloo”? Myself, I could use a lot more Sally than we’ve seen so far. And I find I crave the return of that little weirdo Glenn—what’s he up to these days? In general, it’s been a relatively quiet half-season, and I expect fans will complain if they’re forced to wait until 2015 for the real plot fireworks. Are you expecting any abrupt revelations or jarring violence? What are we to make of the fact that “My Way” (with its lyric about facing “the final curtain”) played as that airplane stewardess snapped shut a curtain behind Megan and Bonnie? I’ll just point out that Don said, “I don’t have anyone” in this episode. Is he clairvoyant? Did Megan’s return to the windswept balcony of the Draper apartment—scene of so many foreboding moments, but not yet any actual death or dismemberment—signal her doom? Read all of Slate’s coverage of Mad Men.